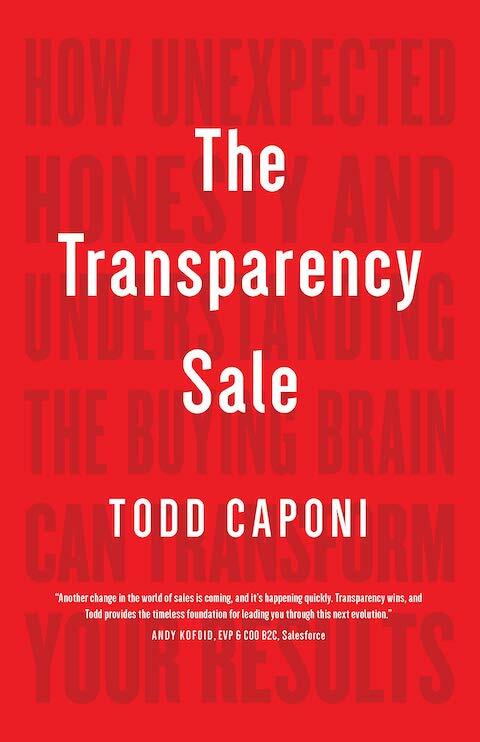 I just read my favorite sales strategy book of all time: The Transparency Sale: How Unexpected Honesty and Understanding the Buying Brain Can Transform Your Results, by Todd Caponi. When it comes to B2B sales strategy, fashions have been shifting for decades. But whether we’re supposed to form relationships, challenge people, sell solutions, or always be closing, one thing has been central. The objective has been to convince people that what you’re selling is a perfect match for what they need. Whether it actually is, is secondary. This is one reason that the targets of these salespeople — as well as their colleagues in the same organization — always feel a little trepidation about salespeople. Look, some of my best friends are salespeople, but let’s admit it: there is a stigma. The reason is that we don’t completely trust you. Everything you say, you could be saying just because your livelihood depends on closing that sale. What would happen if salespeople told the whole, unvarnished truth? That’s the premise of The Transparency Sale, and I love it. Until last year, Todd Caponi was chief revenue officer for PowerReviews, a company that provides online review capabilities to retailer sites. In that capacity, he noticed something fascinating: people are more willing to buy a product whose reviews are in the 4.2 to 4.5 star range than one with a perfect five-star rating. Think about it. One five-star review is great. Only five star reviews? That’s suspicious. All products have flaws. If you’re like me, you start reading the negative reviews. Once you know what the flaws are, you relax. If a few people complained that the hotel’s front desk staff were rude but thousands more think it’s got great rooms and comfortable beds, then I am ready to believe that hotel is right for me. Caponi translates that simple insight into a selling strategy where you don’t just hide your flaws — you lay them out right where everyone can see them. This does two things. First, it jolts people out of the usual sales resistance. And second, it makes them trust you. It turns out that honesty and integrity are effective sales strategies. Why? Because our brains are designed to resist influence. As Todd Caponi writes, “The second the buyer’s brain senses insincerity, ineptitude, or inconsistency, their brain’s ‘uh-oh’ alarm will sound off subconsciously.” He quotes the author and neuroscientist Antonio Damasio: “We are not thinking machines that feel, we are feeling machines that think.” This uncertainty manifests itself in a need to do “homework,” or carefully vet the seller’s statements, which, of course, slows things down and gets in the way of closing the deal. The Transparency Sale convincingly explains how being honest increases the number of qualified opportunities, the average deal size, and the likelihood of closing the deal — and decreases the length of the selling cycle. All four contribute to sales efficiency. Counterintuitively, telling people what your product is bad at along with what it’s good at results in closing more sales, more quickly. This book provides practical strategies for implementing this sales process — it is a fully realized selling system, not just a slogan. It describes everything from email strategies to how to get and why to get references to negotiating strategies and dealing with legal. Salespeople are pushing a rock uphill. The world is stacked against them. Todd Caponi is telling you something you need to hear: that leading with the truth is more like rolling the ball downhill. It gets people on your side. And if your product is any good, they’re a lot more likely then to trust you, to buy the product, and to keep buying it and value the relationship you have created. Since I believe in this selling method, I hereby demand that everyone who wants to sell me anything should use it. Tell me what’s good about what you’re selling — and what it’s not good for, too. Tell me what’s wrong with it and how — or even if — you’re going to fix that. Then I’ll listen, and I’ll trust you. The alternative is that I’ll ignore you and hang up on you. And that’s no fun for either of us. Ben Franklin advised, “Always tell the truth. You’ll astound your friends and confound your enemies.” I agree. So thanks for calling this book to our attention. I’ll read it soon and recommend it to my colleagues here in proposal and marketing. I remember being glad when Message Not Received finally received a one-star review. After a bunch of five-star reviews, I knew that it looked suspicious. I read a while back that Amazon allows reviews from unverified purchases because its employees have run the numbers: All else being equal, polarizing reviews tend to increase sales. That is, would-be buyers want to decide for themselves—at least on some products—if a book or movie is good. I wonder if that’s true for far more expensive products. When I chose which college to attend this principle came into play. It came down to two schools. At the first, the student hosts said they liked everything about the school and couldn’t name a “least favorite.” At Boston University, the student hosts loved BU, warts and all. That’s where I went!